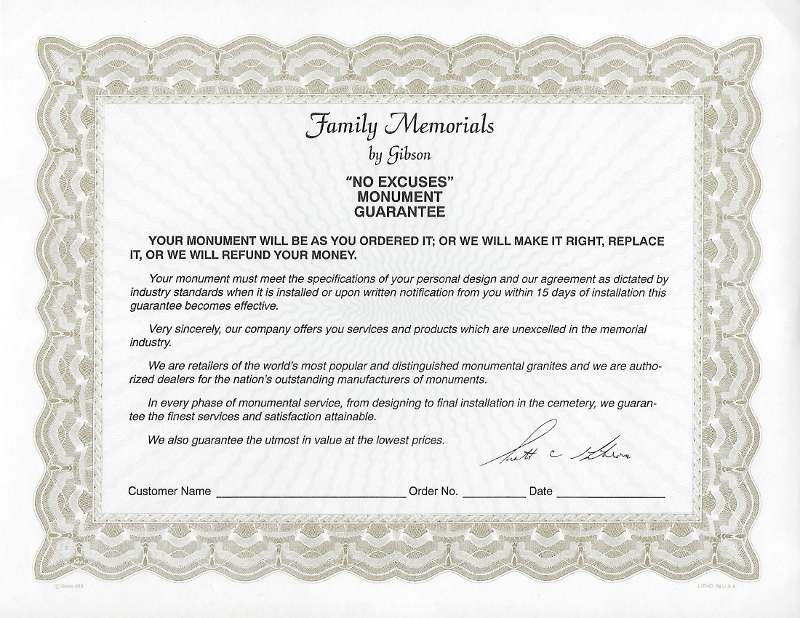 The “No Excuses” Monument Guarantee that comes with every monument we sell! At Family Memorials by Gibson, we guarantee that every memorial will be of the finest granite quality: free of cracks or defects. The granite stone is guaranteed against discoloration (other than natural aging of stone in cemetery). Please rest assured that we will replace any piece of granite that shows faulty integrity due to the stone itself. We also re-level the pieces if they should become un-level. Please contact us if this should become an issue. Every stone is inspected before it is considered completed. All workmanship of lettering and design will be artistically done. If you would like to see the finished stones before they are placed in the cemetery, we can certainly arrange that. Just let us know so we can make note of it on your contract. Please note that we cannot guarantee the stones against acts of nature (destructive weather – tornadoes), or mowers getting too close and chipping the granite pieces, vandalism, accidents with automotive/trucks/vaults and other mechanical items that do work in the cemetery. These things may be covered under your purchasers’ homeowners’ insurance policies. Please check with your insurance holder for their guidelines. The concrete is not guaranteed from aging. We use the best concrete we can and pre-stress it so it has “super strength.” It will weather and change color where it is exposed. It may also become chipped and damaged by lawn care vehicles. This is out of our control. We are proud of the fact that we are a family-owned business. We are 3 generations strong and working on the 4th generation. We finally guarantee that, should any parts of said memorial develop any defects as indicated herein, we will unconditionally replace said parts free of all expense to the purchaser or their heirs.